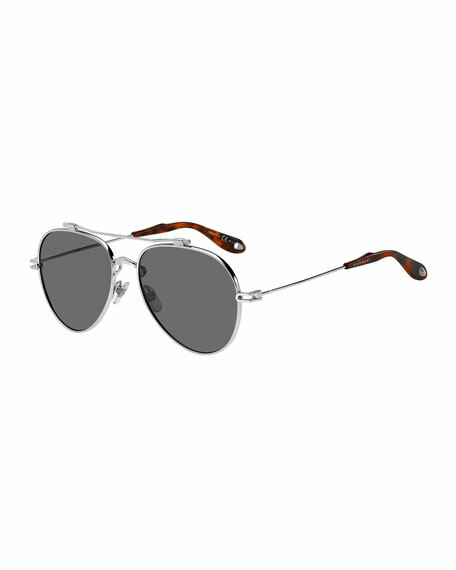 Givenchy men's "GV 7057" aviator sunglasses. Brow bar with ridged ends. Givenchy, founded in 1952 by Hubert de Givenchy, is an international luxuryhouse known for its Haute Couture, ready-to-wear, and accessoriescollections for men and women. The codes of the Housecool chic, sobriety, femininity, and aristocratic eleganceare carried into the future with dark romanticism and sensuality, combining pure lines with a graphic structure.